Donald Clark Plan B: Do we really need all of this 'mentoring' malarkey’? Do we really need all of this 'mentoring' malarkey’? I’ve never had a mentor. I don’t want a mentor. I don’t much like mentoring. I know this is swimming against the tide of liberal orthodoxy but I value liberal values more than I value fads, groupthink or orthodoxy. Don't mind people doing it but there are many reasons why I’m suspicious of mentoring. 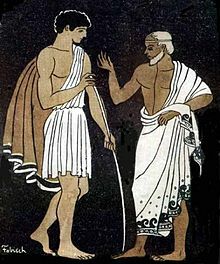 Mentor was a character in Homer’s The Odyssey and it is often assumed that his role was one of a guiding, experienced guide for his son and family. This is wrong. Mentor was simply an old acquaintance, ill-qualified to play a protective role to his family, and worse, turned out to be a patsy for a hidden force, the God Athena. A similar tale has unfolded in recent times, with mentoring being revived on the back of late 19thcentury psychoanalytic theory, where the original theory has been abandoned but the practice upon which it is based survives. There is another later work of fiction that resurrected the classical model as a source for the word ‘mentor’ in education, Fenelon’s Les Adventures de Telemaque(1699). This is a tale about limiting the excesses of a king and reinforced the presence of the word ‘mentor’ in both French, then English. Yet Mentor, in this ponderous novel, is prone to didactic speeches about how a king should rule (aided by the aristocracy), hardly the egalitarian text one would expect to spark a revolution in education. Interestingly, it pops up again as one of two books given to Emile in the novel of the same name, by Rousseau. Mentoring came out of the psychoanalytic movement in education, through Freud and Rogers. Nothing survives of Freud’s theories on the mind, education, dreams, humour or anything else for that matter. But Rogers is different. His legacy is more pernicious, as his work has resulted in institutional practice that has hung around many decades after the core theories have been abandoned. We need to learn how to abandon practice when the theories are defunct. As Homer actually showed, one person is not enough. To limit your path in work or life to one person is to be feeble when it comes to probability. Why choose one person (often that person is chosen for you) when there are lots of good people out there? It stands to reason that a range of advice on a range of diverse topics (surely work and life are diverse) needs a range of expertise. Spread your network, speak to a range and variety of people. Don’t get caught in one person’s spider’s web. Mentoring is this sense is a singular trap. You don’t need a single person, you need advice and expertise. That is also to be found in a range of resources. Sure, a range of people can do the job and the best write books. Books are cheap, so buy some of the best and get reading. You can do it where and when you want and they’re written by the world’s best, not just the person who happens to be chosen in your organisation or a local life coach. And if you yearn for that human face, try video – TED and YouTube – they’re free! I’d take a portion of the training budget and allow people to buy from a wide reading list, rather than institute expensive mentoring programmes. Then there's social media, a rich source of advice and guidance provided daily. This makes people more self-reliant, rather than being infantalised. Twitter also has strong benefits in CPD. Little (1990) warned us, on mentoring, that, “relative to the amount of pragmatic activity, the volume of empirical enquiry is small [and]... that rhetoric and action have outpaced both conceptual development and empirical warrant.” This, I fear, is not unusual in the learning world. Where such research is conducted, the results are disappointing. Mentors are often seen as important learning resources in teacher education and in HE teaching development. Empirical research shows, however, that the potential is rarely realized, see Edwards and Protheroe (2003) and Boice (1992). The results often reveal low level "training" that simply instruct novices on the "correct" way to teach Handal and Lauvas (1988), Hart-Landsberg et al., (1992). Indeed, much mentoring has been found to be rather shallow and ineffective Edwards, (1998). Practice gets amplified and proliferates through second-rate train the trainer and teacher training courses, pushing orthodoxies long after their sell-by, even retirement, date. Mentoring has sometimes become a lazy option and alternative for hard work, effort, real learning and reflection. By all means strive to acquire knowledge, skills and competences, but don’t imagine that any of this will come through mentoring in any efficient manner. Mentoring is what parents, grandparents and older members of the community used to do, and well. I’m all for the passing down of learning and wisdom, but when it gets formalized into specific people, with supposedly strong ‘mentoring’ skills, I have my doubts. By all means encourage people to share, especially those with experience but don’t kill the human side of this with an over-formalised process. I know that many of you will feel uncomforted by these arguments but work and life are not playthings. It is your life and career, so don’t for one minute imagine that the HR department has the solutions you need. Human resources is there to protect organisations from their employees, rarely either human or resourceful. Stay away from this stuff if you really want to remain an independent thinker. Edwards and Protheroe (2003)Learning to See in Classrooms: What are student teachers learning about teaching and learning while learning to teach in schools? British Educational research Journal. Little, J.W. (1990) ‘The Mentor Phenomenon and the Social Organisation of Teaching’, in: Review of Research in Education. Washington D.C: American Educational Research Association.